Arthritis is a global epidemic affecting daily life of fifty millions of people in the United States only. The exact cause is not known and its cure does not exist, either. Various medical, nutritional, and physical regimens are available for the management of associated joint discomfort. Both prescriptive and OTC medications provide an effective, temporary relief but are sometimes associated with serious cardiovascular and gastrointestinal side effects. Recently, dietary approach has demonstrated in human clinical trials its potential of addressing joint discomfort in a safe and effective manner. BioCell Collagen® is one of these exemplary ingredients. Arthritis is a group of chronic diseases involving the synovial joint which is the most common and active joint in the body. The synovial joint is characterized by the articular cartilage and the synovial fluid. Collagen type II, HA and chondroitin sulfate are key protein and glycosaminoglycan (GAG) molecules essential for the healthy structure and function of the cartilage while HA is a major lubricating molecule in the fluid. Despite its unknown causes, development of arthritis essentially entails their degradation leading to chronic joint discomfort crippling sufferers unless intervened. The apparently complex process underlying joint discomfort could be effectively addressed by a holistic approach via a synergy among the natural constituents of joint structure. BioCell Collagen provides essential nutrients for improving and maintaining healthy joints. BioCell Collagen is a naturally occurring matrix of hydrolyzed collagen type II and low molecular weight (LMW) hyaluronic acid and chondroitin sulfate, all of which contribute to the maintenance of healthy joint cartilage and synovial fluid. Additionally, BioCell Collagen's patented technology makes the cartilage-forming molecules (collagen type II, HA, and chondroitin) highly bioavailable for fast and effective absorption, and it may help rebuild worn-down cartilage as well. The safety and efficacy in managing joint discomfort was demonstrated by three human clinical trials as follows. This trial enrolled 89 subjects who were experiencing pain caused by joint discomfort. The subjects ingested 2 g daily of BioCell Collagen® for 45 days. Out of the 89 subjects, 80 (89%) experienced improved joint comfort. In contrast, only one subject who took placebo had a similar effect. No adverse events associated with BioCell Collagen® were reported. This randomized, double-blind, and placebo-controlled trial enrolled 16 subjects who had various degrees of joint discomfort. The subjects ingested 2 g daily of BioCell Collagen® for 8 weeks. As compared to placebo, BioCell Collagen significantly reduced the joint discomfort as much as 40% at the end of the study. No adverse events associated with BioCell Collagen were reported. This randomized, double-blind, and placebo-controlled trial enrolled 80 subjects who had advanced degree of joint discomfort. The subjects ingested 2 g daily of BioCell Collagen for 10 weeks. 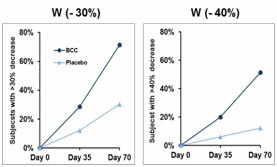 As compared to placebo, BioCell Collagen® significantly reduced joint discomfort, confirming the outcome of the earlier trial and no adverse events associated with BioCell Collagen were reported. 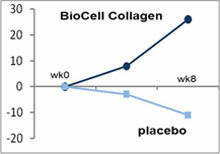 A key finding was that the subjects ingesting BioCell Collagen® experienced at least 30% reduction of discomfort while 30% in the placebo showed a similar effect. When a stricter criterion of minimum 40% decrease in joint discomfort is applied, 51% in the BioCell Collagen group enjoyed the benefit whereas only 12% in the placebo did so. 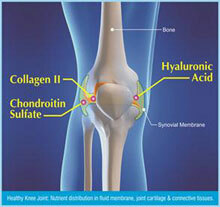 BioCell Collagen® improves joint discomfort.